This Sunday is Mother’s Day — if you forgot to put in your order for a bouquet to be delivered to your mom, you still have time to quickly order some flowery fonts and send her a bouquet of glyphs. With the combination of beautiful images from fStop and the selection of fleurons and springtime fonts on FontShop, you can also create a quick e-card to send your mom if you can’t visit her this weekend. Check out our Glyph Garden board to get started! Hello, March! As the sun shines down brightly on our San Francisco office, it continues to nurture our love for fonts — a new board on Pinterest has bloomed! 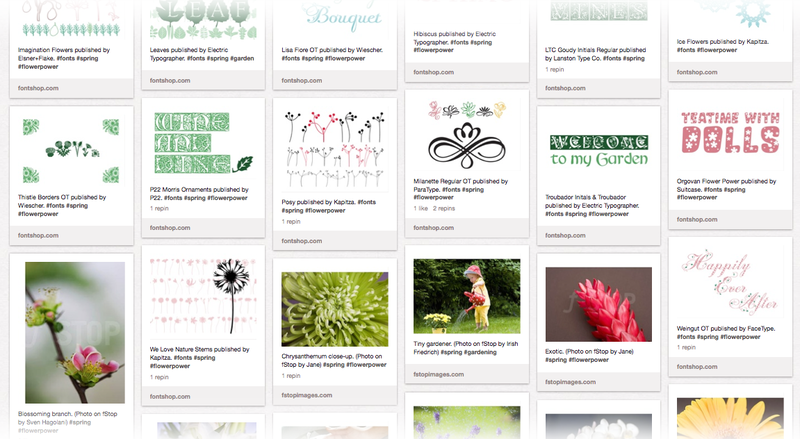 Our Glyph Garden pinboard is a collection of pixels and perennials. Paired with beautiful springtime visuals from fStop Images, flourishing fleurons such as Blossomy or Cadence will make you want to pick out your own bouquet of fonts. Or if you like to get your hands dirty gardening in the sunshine, Kapitza’s Allotment will help you become a digital gardener. Don’t forget that plants need plenty of water — check out our Water You Waiting For pinboard, too!